Greg and Jane Hills and their two children, Austin and Whitney, celebrate Christmas as countless Americans do--at home, exchanging gifts and sharing traditional holiday meals. Here, their friends and neighbors also happily mingle and enjoy the festive music and cheerful repartee. What makes the Hills family holidays unique is the location they call home--Aspen, the glittering town high in the Colorado Rocky Mountains, where every view merits a Christmas card. The family occupies a chic downtown loft built as part of an ambitious project (Greg and Jane are commercial developers) to preserve the better part of a historic neighborhood. "The city granted us permission to develop the parcel with the stipulation that we would restore three 19th-century cabins on the property to their original conditions," Jane explains. "They also insisted that the cabins continue to be used for commercial purposes, so we chose one of them as the office for our business." Mountains freshly capped with snow and ever-so-apropos evergreens provide extra seasonal background to their built-new-to-look-old structure, with interiors fashioned by Los Angeles-based design talent Kevin Corn. Inside the Hillses' loft, a stylish tension of architectural components marries warmth and comfort with features that could date back to a 19th-century industrial facility. Large, arched factory windows, recycled flooring, and exposed metal-and-wood structural ceiling beams make the space feel as though it has been in place for decades. With sensitivity to the neighborhood restoration efforts, Corn incorporated decorative treatments within the second-floor loft that illustrate both the family's modern lives and the nearby area's landmark past. 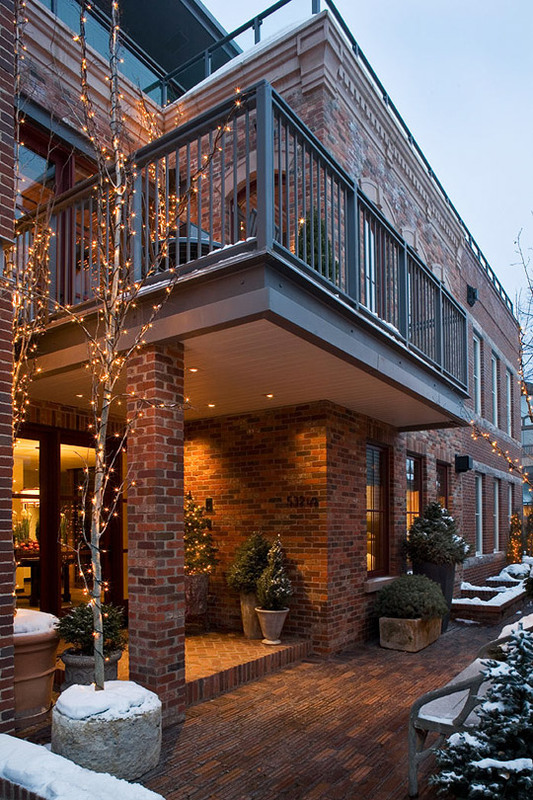 The holiday spirit greets visitors in the ground-floor entry, fitted with a glass elevator that lifts to the loft and to the third-floor master bedroom. 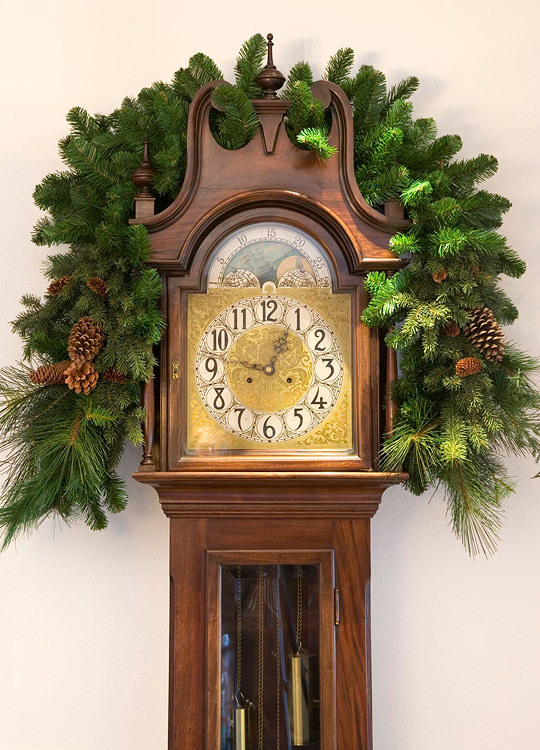 Seasonal arrangements of blooming paperwhites, miniature trees, a basket brimming with pinecones and pomegranates, and a penny candy-filled jar huddle on a round mahogany table. The spacious second floor provides clearly defined areas, including a place for formal dining, a kitchen, a den, and the living room, where the Christmas tree occupies a niche. Bedecked in unmatched ornaments collected by the family, the tree dazzles with a pleasing bit of decorative disorder in a room that otherwise bears a clean, sophisticated appearance. "I like neutral, not flashy," Jane notes. "You can always add color accents if you want change." Corn selected creamy white fabrics for the living room, paying close attention to texture. Two different weights and weaves of white wool hang behind a wood valance at the tall arched windows; an inner sheer diffuses the light, while an outer layer of gabardine offers nighttime warmth. "At an elevation of 10,000 feet, the light can be blinding," Corn explains. "And with windows this big, the fabric needs to have considerable heft." The sofa and two upholstered chairs sit in front of the fireplace with its handsome steel surround. Twin glass-top coffee tables are nestled together, elegantly signaling the season with a stately arrangement of white amaryllis arranged in a large glass bowl. The generously sized walnut dining room table speaks to Greg and Jane's convivial entertainments--even when it's not Christmas. Precise, tickinglike vertical stripes cover the chairs, a contrast to the rough organic rust and gray of the brick walls. 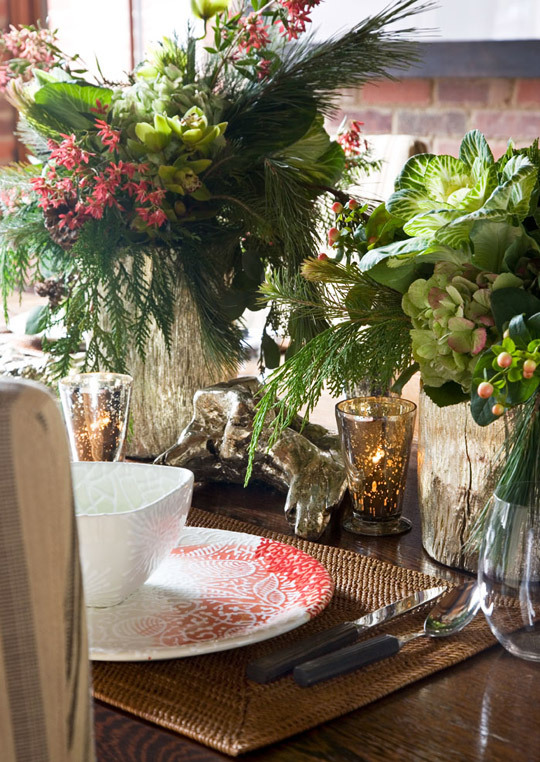 At Christmas, the table display features an array of greenery and blossoms tucked into hollowed-out logs with silver leaf embellishment, a wonderful variation on holiday decorating. A black iron chandelier with white glass shades hangs above the table and reinforces the metal theme throughout the room. "I didn't want it to catch the eye but rather blend into the background," Corn explains. The kitchen marks a noteworthy juxtaposition of urban and country. Stainless-steel appliances complement streamlined oak cabinets stained ebony. A zinc-top table with a pine trestle base exemplifies cottage charm, especially with old wicker chairs pulled up to it. Which season qualifies as most beautiful in this breathtaking Zip code with its year-round outdoor attractions is debatable, but there's no doubt that the winter holidays are especially meaningful for the Hillses. 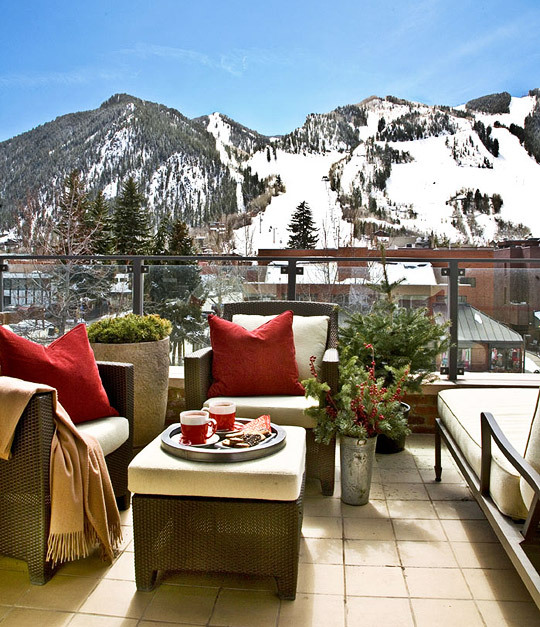 "Aspen is our real home," says Jane, "not a place where we occasionally visit to ski or vacation. Our children grew up and went to school here, and we are active in local community affairs. This is where we live and create family memories." Interior designer: Kevin Corn, Kevin Corn Design, 6161/2 N. Doheny Drive, Los Angeles, CA 90069; 310/270-4695, kevincorndesign.com. Kitchen design: Cooper-Pacific Kitchens, Pacific Design Center, 8687 Melrose Ave., Suite G-299, West Hollywood, CA 90069; 310/659-6147, 800/743-6284, cooperpacific.com. Sofa (custom, #2644); chairs (custom #641): A. Rudin Showroom, 310/659-2388, arudin.com. Sofa and chair fabric ("Ankara Chenille"/Olive #HW-0872-GLV): Hinson & Co., 212/688-5538. Beige pillow fabric ("Heart & Soul"/Barry White, by Great Plains); taupe pillow ("Heart & Soul"/Blondie, by Great Plains): Holly Hunt, 312/661-1900, hollyhunt.com. Brown trim on beige pillow ("Castile Tape"/Bronze #40064-03): Cowtan & Tout, 212/647-6900, cowtan.com. Pillow fabrication: Lily Designs, 818/545-8607. Black side table next to sofa (vintage): Brenda Antin, 323/934-8451. Drapery ("Bechamel"/Nuage #938001-05); drapery cuff ("Bechamel"/Blonde #938001-01): Rogers & Goffigon, 203/532-8068. Bench (custom): Kevin Corn Design, 310/270-4695. Leather bench fabric ("Sugar Daddy," by The Ranch Home Outfitters): Mimi London, 310/855-2567, mimilondon.com. Round mirror (antique/Rosewood, by Sergio Rodrigues): Blackman Cruz Los Angeles, 310/657-9228, blackmancruz.com. Side table (antique, "Café Table"); table lamp: Lee Stanton Antiques, 310/855-9800, leestanton.com. Gear hurricanes (glass with dark bronze base): Baker, Knapp & Tubbs LA, 310/652-7252. Floor lamps (tent-style in matte nickel): Hinson & Co., 310/659-7075. Area rug ("Luxe"/Silver Topaz, Textured Sisal Collection): Merida Meridian Inc., 800/345-2200, meridameridian.com. Track lighting (Theatrical Clamp on Lights #T295, 35-50W Par 20; finish: Black): Juno Lighting, 800/367-5866, junolightinggroup.com. Paint ("Dove White"): Benjamin Moore & Co., 888/236-6667, benjaminmoore.com. 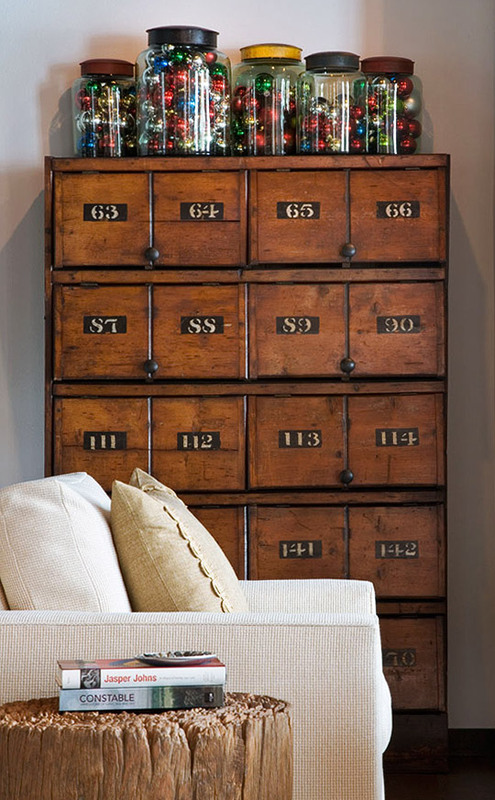 Atop a cabinet once used to organize monks' mail at an old monastery, oversize jars corral colorful Christmas balls. Monk's mailbox cabinet (vintage): Emerson Troop, 323/653-9763, emersontroop.com. Glass jars (vintage): Big Daddy's Antiques, 310/769-6600, bdantiques.com. Wood block mortar side table: Mecox Gardens, 310/358-9272, mecoxgardens.com. 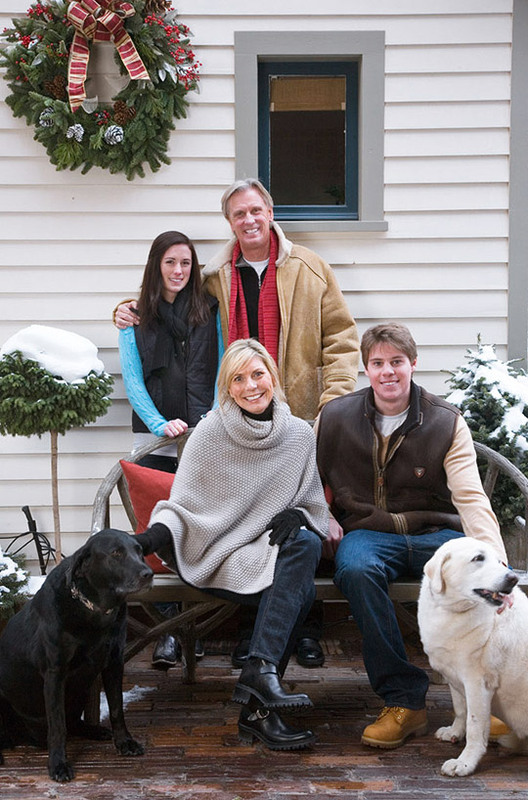 Greg and Jane Hills with their children, Whitney and Austin, and pooches Bourque and Lucky. 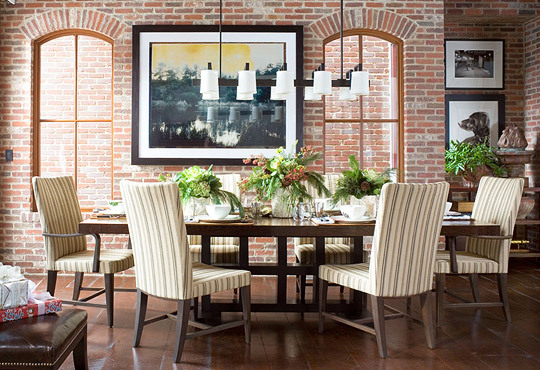 Open to the living room and adjacent to the kitchen, the dining room takes its masculine cue from a wall of rugged exposed brick. A sturdy walnut-and-steel dining table taps into the holiday spirit with silver-leafed logs packed with greenery and berries. Table ("Ocampo"): Berman Rosetti, 310/476-6242, bermanrosetti.com, available through Mimi London Inc., 310/855-2567. Chairs ("Siena," Studio H, Holly Hunt Collection): Holly Hunt, 312/661-1900, hollyhunt.com. Chair fabric ("Rigoletto"/Carbone #2315-6): Rose Tarlow-Melrose House, 323/651-2202, rosetarlow.com. Chandelier ("Charlotte" with linen shades): Paul Ferrante Inc., 323/653-4142, paulferrante.com. Photograph (Walton's Lake, by Jim McHugh): Jim McHugh Photography, 323/466-2890, jimmchugh.com. Dinnerware (by artist Jody Guralick): Dish Studio, 970/925-4326, dishstudio.com. 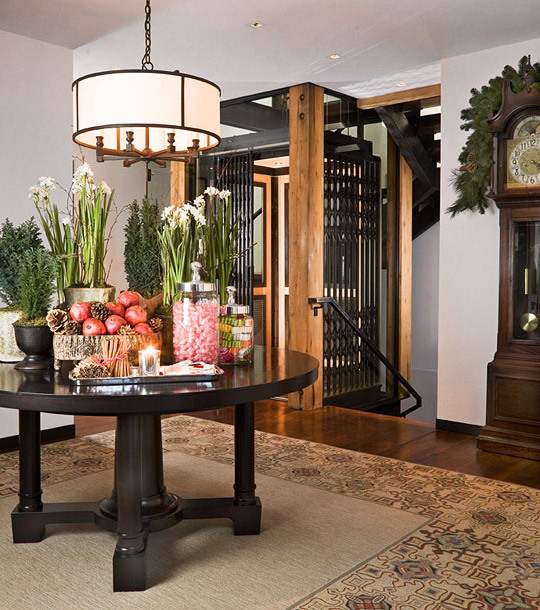 In the entry foyer, the linear framework of the elevator cage is in pleasing contrast to a round table topped with elements from nature--pomegranates, pinecones, paperwhites, and miniature pine trees. Pedestal table (custom, "Aspen," Studio H, Holly Hunt Collection): Holly Hunt, 312/661-1900. Chandelier (custom, "Little Crescent Heights"): Paul Ferrante Inc., 323/653-4142, paulferrante.com. Elevator (custom): John Olson Builder Inc., 970/923-4233, johnolsonbuilder.com. Hooked area rug (custom): Elizabeth Eakins, 212/628-1950, elizabetheakins.com. The generously scaled kitchen was designed for cooking and for accommodating informal family meals. Cabinets ("Vanguard Flat Panel"/Black Forest): Wood-Mode Inc., 877/635-7500, wood-mode.com. Kitchen design: Cooper-Pacific Kitchens, 310/659-6147, cooperpacific.com. Window treatment ("Cyclades"/Milos #910042-5): Rogers & Goffigon, 203/532-8068. Zinc-top table; wicker chairs; lighting fixture (vintage, chrome): Brenda Antin, 323/934-8451. Wicker-chair fabric ("Pembroke"/Sandalwood #92522-06): Rogers & Goffigon, 203/532-8068. Refrigerator; wine cooler: Sub-Zero Inc., 800/222-7820, subzero.com. Range and hood: Thermador: 800/656-9226, thermador.com. Faucet; pot-filler faucet: Franke Kitchen Systems Division 800/626-5771, frankeksd.com. 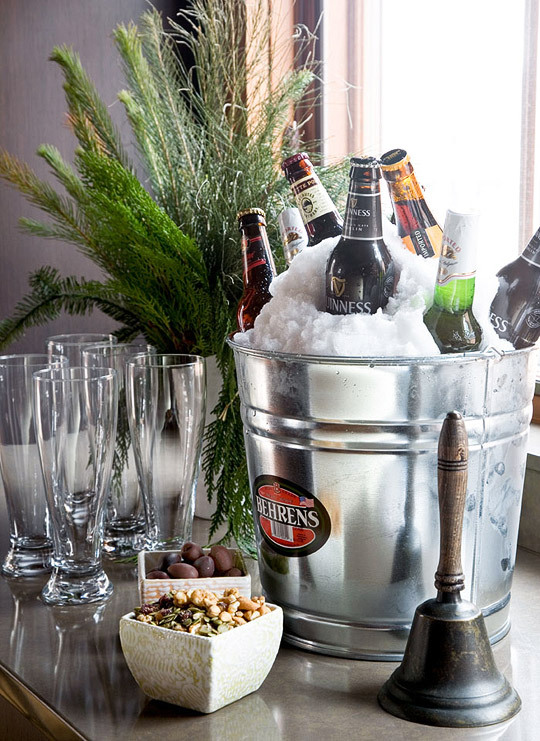 The Hillses gear up for holiday entertaining with a bucket of iced beers and glasses set up on the kitchen counter. Twinkling holiday lights decorate the downtown brick building that Jane and Greg built. 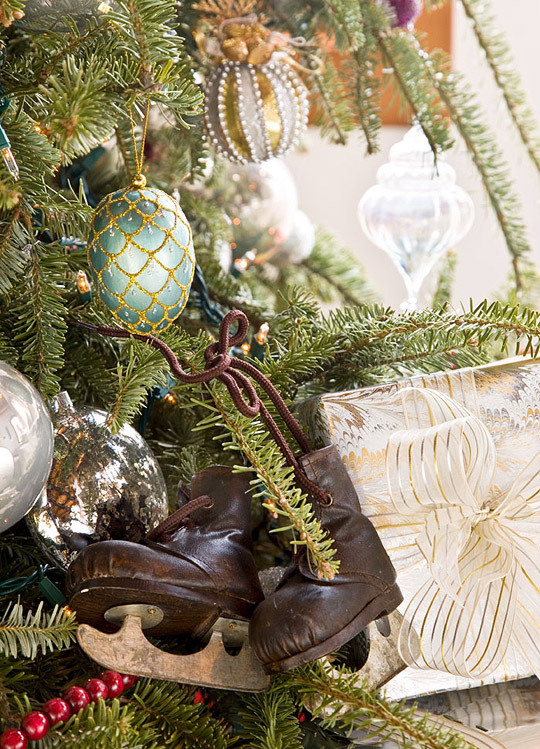 On the Christmas tree, a diminutive pair of hockey skates references the sport that both of the kids play. The master bedroom deck affords a lovely view. Rattan chairs and ottoman: ("Barcelona"/Bronze); Janus et Cie, 312/822-0460, janustcie.com. Fabric ("Very Terry"/Sand #980-23): Perennials, 888/322-4773, perennialsfabrics.com. Chaise ("Beaufort Sun Chaise"): McKinnon and Harris, 804/358-2385, mckinnonharris.com. Flooring ("Summit Flooring, Flamed" #AS8391): Ann Sacks, 800/278-8453, annsacks.com. Red pillows: Crate & Barrel, 800/996-9960, crateandbarrel.com. Throw pillow: Ralph Lauren Home, 888/475-7674, ralphlaurenhome.com. 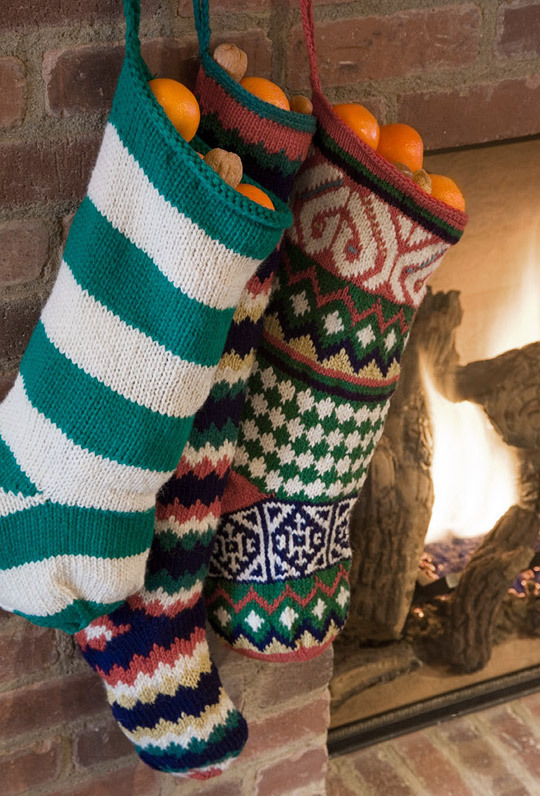 Knitted stockings hang from the fireplace mantel in the family room. 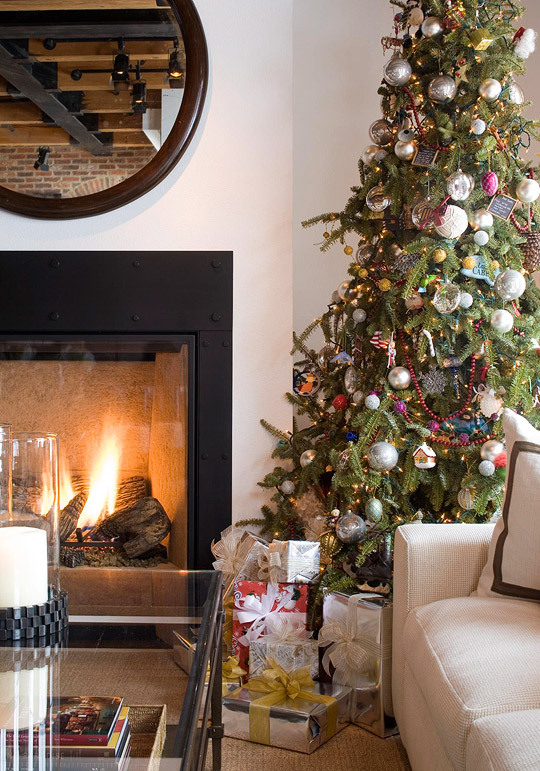 A roaring fire and a traditional tree set the stage for a classic Christmas. The dinnerware was designed by family friend Jody Guralnick.